This Bonobus saving or call it a scheme is going back as far as the days of Pesetas. That was almost twenty years, ago. Then, Titsa used to talk about it in connection with Transbordos, as you will be able to make out in the following photo which was captured with an i-phone by the Tenerife holiday home insider online in March 2019. I've just learned in 2019 that this scheme is still working. I thought it had been discarded. Circumvalisación still means that you can take two or three different bus lines to your final destination which may be your departure point by only paying for one track more or less. It had to be within one hour. Now, you have to catch the second bus within half an hour of leaving the first bus. You pay less although you may travel within as many as three municipalities. In fact, all three buses must have different numbers. Only now, the term Traslados is used, contrary to Transbordos, way back. Traslados alias Transbordos mean change overs to different routes with different bus lines i.e. number which may not necessarily be longer tracks. The journey went from Los Realejos to Puerto de la Cruz by bus 352. 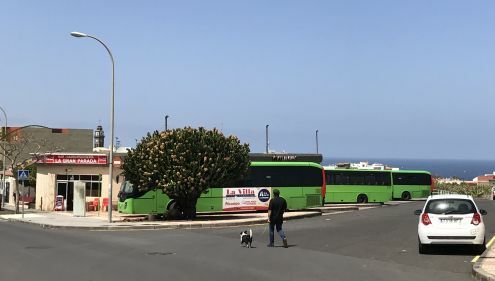 Then, it continued from Puerto de la Cruz to La Orotava with the use of another bus which was stationed up the road and that also had the number 352 but, indicated La Orortava as destination. The lady at the Orotava information counter told me that this was not a Traslado, as I took both times the Line 352 which the computer told her, although different vehicles. I should have employed or the line 348 or 345. Then, the machine wouldn't have debited my Tenmas card, as that would have been a Traslado. Hence, you move about cheaper with transfers called Traslados, as already was the case with the Bonobus card. Last year in 2018, I went to La Orotava from Los Reajejos via Puerto de la Cruz and back from La Orotava to Los Realejos with a mountain bus all within one hour crossing three municipalities all for the price of Euro 1.15 only. In fact I had traveled on after a doctor's appointment with shut doors very close to the Orotava bus station. The situation for Traslados with both cards hasn't changed. Mind that I can only vouch for that for Tenerife by my own experiences as a very frequent bus user. I can still score with the Tenmas when I go from Los Realejos to Santa Cruz by changing buses, as was the case with the Bonobus. Again the condition is a very short delay of half an hour during transfer. (Traslado) Then, the machine doesn't count both tracks separate but takes the first into consideration and provides a discount again. The scheme is slightly complicated, as you may notice by Titsa's explantations portrayed in the snap shot above and on its Facebook side in a link below.